A loft bed and custom shelves make a narrow, single bedroom spacious and functional. Aaron's Room: A narrow room grows up. 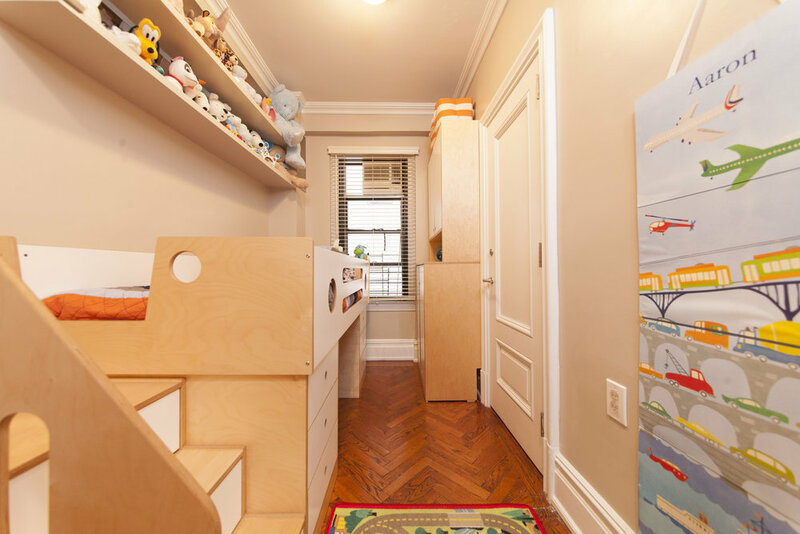 When it was time for three-year-old Aaron’s room to grow up a bit, his parents turned to Casa Kids to make the most of a narrow, former maid’s quarters in their Upper East Side apartment. 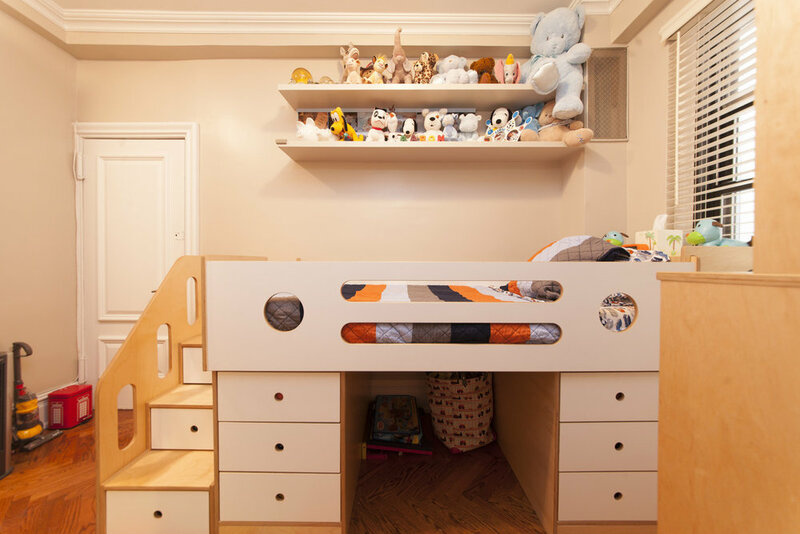 We used custom shelving and a custom Dumbo Loft Bed Low to create a two-phase space with storage and style that was safe for a three-year-old and will transition with Aaron as he grows. 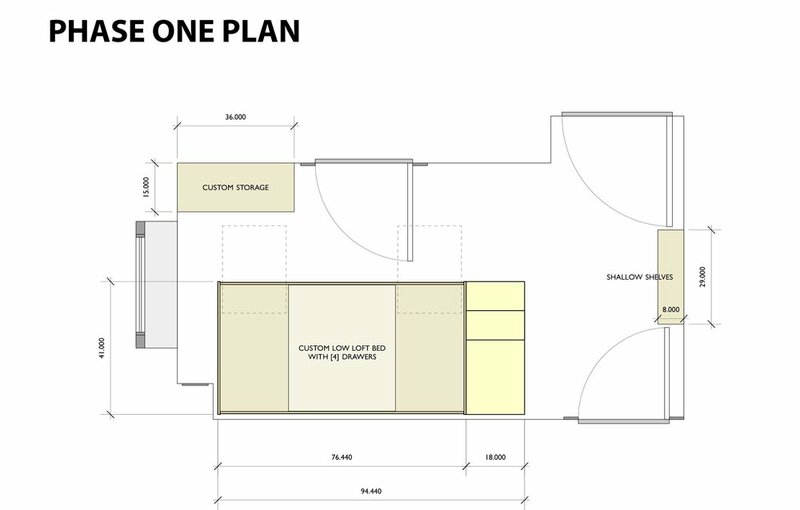 We designed the initial phase with a low loft because any bed with a mattress support raised over 30" from the ground is considered unsafe for kids under six years of age, and Aaron was only three. We used custom shelving and a Dumbo Loft Bed Low, which we customized to have two three-drawer cabinets, to make the most the space’s height and create storage in phase one. A nook in the wall could have meant unused space. We were able to work around the nook by creating a custom bed tray, making full use of the space and giving Aaron convenient place to keep items handy. Custom shallow shelves at the end of the room allowed for added storage without interfering with doors. A neutral color palette of white and light, natural woods kept the space bright, airy, and full of storage without feeling cramped. 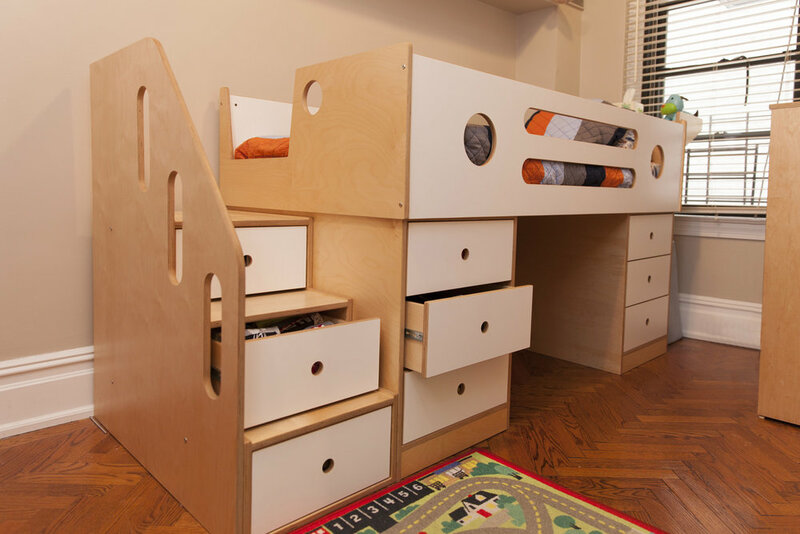 When Aaron reaches age six and is ready for phase two, we will convert the low loft to our regular Dumbo Loft Bed by stacking the two cabinets with drawers and adding a desk on the other end to create study space.